Florida is sport fly fishing at its best. Almost the entire coastline has great saltwater fishing for Tarpon, Bonefish and Redfish. Like Alaska, there are so many great places to fish that it is hard to pick just a few. FL saltwater fishing is known all over the world and that is what gets most of the attention. The shallow waters provide great sight fishing, and there are many fish charters and fly-fishing guides that will take you there. Many of the areas can be fished by wading while other spots will require a boat. You really should consider using a guide to be successful. They will know the best places to fish, what to use, and how to do it. Fly-fishing the flats is much different then a mountain stream. There is also a big difference between catching a 12” Rainbow trout and a Tarpon that weighs over 100 lbs. I am mentioning a few great places to fish, but there are far more places to mention than these. You may consider what else you want to do while in the state besides fly fish. When you determine that, you then can see where to fly fish around there. If you are near the coast you should have no problem finding a great place to cast and have success. Their fish and game website says it best. Florida has only one season. The fishing season. 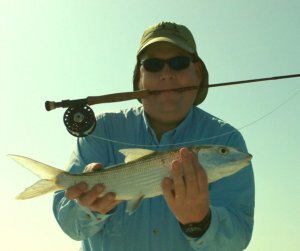 Amelia Island is near Jacksonville and provides great fly-fishing for Redfish. The best time to sight fish is during low tide during daylight hours. This area of the state has great fly-fishing for Redfish. Click below for more. The Florida Keys is the best place to catch Tarpon, Bonefish and Permit. The Tarpon can get as big as 6’ long, and catching one is not as easy as hooking one. The Keys have miles and miles of Tarpon rich fly-fishing. There are many great fly-fishing guides available for this great fly-fishing destination. Book now! The FL Keys has the best Tarpon Fishing in the world, read more about it. My friend Rich with a nice Bonefish! He only caught a few that day. A couple months later he slayed them on the Green River in Utah. Just a few dozen fish off a drift boat. He didn't get any pictures of those, but I know he caught em! Homosassa has good fly-fishing for Redfish but it is the record size Tarpon that bring people to this area. This is the best place in the world to catch a trophy size Tarpon. Looking for a Trophy Fish? Learn more about Homosassa. The Indian River Lagoon “IRL” extends about 150 miles on the east coast. This stretch has some prime fishing areas such as Turkey Creek, Banana River, Sebastian River and Mosquito Lagoon to name a few. These are all good locations to have successful shallow water fly-fishing near Orlando. Late spring and early summer bring with it a great food supply for the local Tarpon to gorge themselves on. Located in southwest part of the state, the mangrove islands in this area has over 70 miles of great fly-fishing. Florida fishing regulation and license information. Florida is a great place to fly fish. Click here to choose another state.